Blended learning programs can include many deliverables. 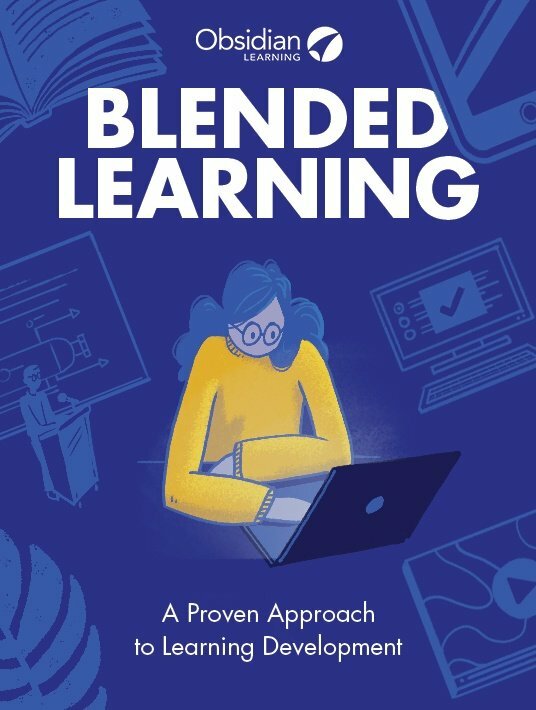 Assuming that preliminary analysis resulted in concrete goals for the program, converting those goals into actual, measurable learning objectives specific to each deliverable is critical for the success of the blended learning strategy. 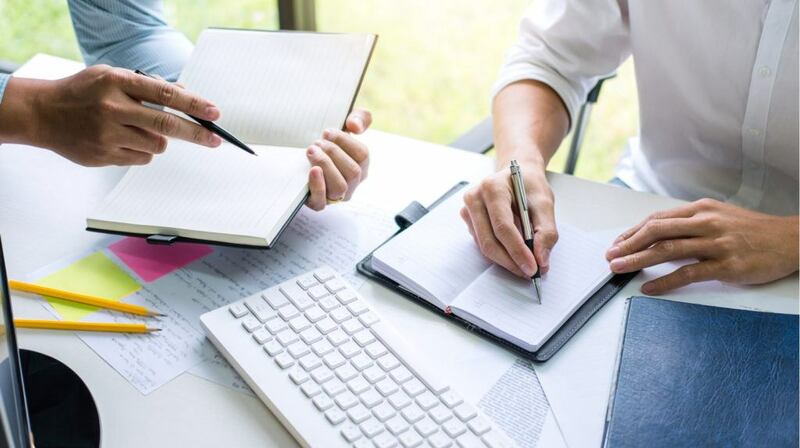 Here, we will give you a 4-step guide to writing effective and powerful learning objectives to support your blended learning program. Discover how to integrate your new and existing learning assets, technology, and the latest from the field of neuroscience into cohesive traditional learning to improve learning outcomes. Deciding what level of mastery is required can shape your course objectives. In general, learning activities fall somewhere along the spectrum from awareness to mastery. Your audience just needs to be made aware of something (e.g., there is a new benefit available to them starting on the 1st of the next month). Your learners need to be able to do something in a different way after taking the course (e.g., they need to know how to select and enroll in the new benefit before the 1st of the next month). Your learners need to be sufficiently skilled at something, such that they can guide someone else in performing the task (e.g., your learners are in the HR team, and they will be supporting employees throughout the benefit-selection process before the 1st of the next month). Tip: Identify any prerequisites that learners need to be successful in your course. Defining these upfront can help your learners successfully meet your objectives. In blended learning, we use different elements to build competency so the learner can achieve the necessary level of mastery. What are the course goals? What will the learner be able to do or know after taking this course? I always start this process by completing the sentence "After taking this course, the learner will be able to…". The items that complete the sentence are generally broader targets, so there may only be 3-6 for a particular course. Maintain a safe, healthy work environment for your team. These broader course-level objectives can then be broken down into the specific tasks/skills/behaviors required to achieve a specific course goal. Tip: Be sure to tie the course-level objectives to an important business/organizational goal. In the example, our construction client is looking for an improved productivity metric within 6 months for teams whose supervisor has attended this training as compared to those who have not. Let’s take our course objective, "Effectively handle HR issues for your team". What does that entail? Talking with the content experts, we determined that the learners needed to have an awareness of 4 specific HR policies, to be able to take appropriate disciplinary action using verbal warnings, written warnings, and termination, and to conduct quality employee performance evaluations. Given an example of performance evaluation form, conduct a brief employee performance evaluation. Is my objective learner-centric? Is it written from the learners’ point of view, or is it describing what the instructor will be doing during the lesson? Does it contain an appropriate action verb? 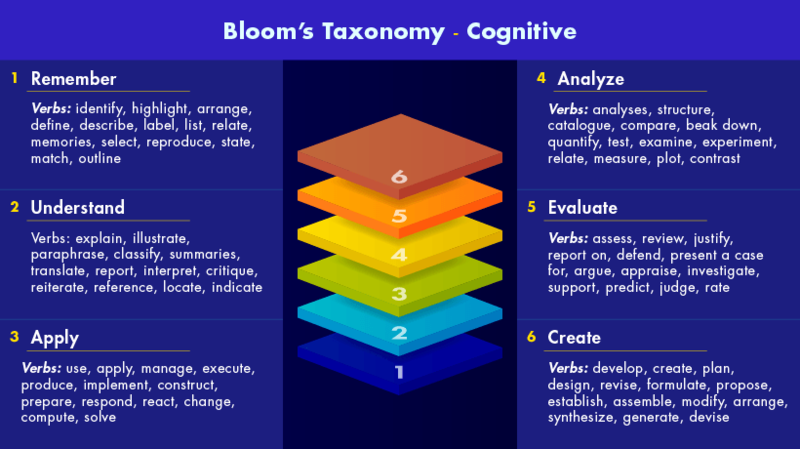 Tip: Use Bloom’s taxonomy to help identify where you are on the learning hierarchy and then which verb might be most appropriate. 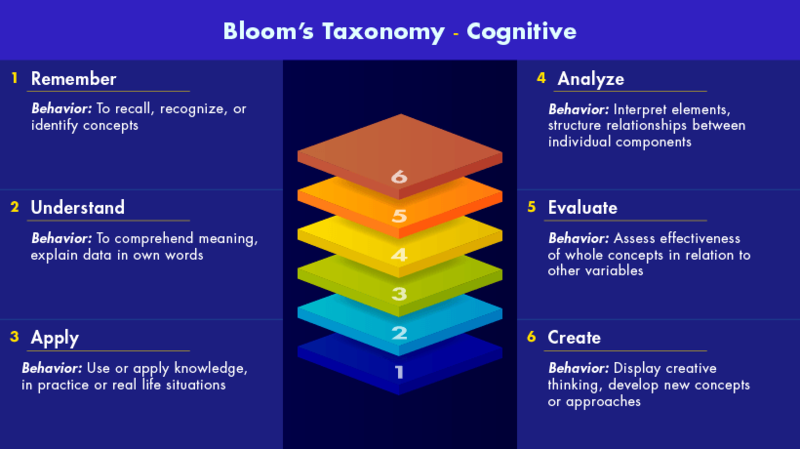 The competency level can give you a clue as to what level of Bloom’s taxonomy your objectives should be. Is it measurable? Avoid vague unmeasurable verbs like "understand", "appreciate", or "know". Instead, use action verbs that will make it obvious to the learner if they have been successful – words like "choose", "calculate", or "demonstrate". Also, use only one action verb per objective to simplify evaluation. Luckily, there are a lot of good resources to help you find measurable, actionable verbs to use. Here are a few from each level to get you started, but a quick online search will produce many more. Is the objective clear and concise to someone not already familiar with the content? Does it reflect what is doable in your course? For example, if we include our 4th objective about demonstrating documenting various levels of discipline but because we are short on time, we do not include an exercise where learners actually demonstrate this skill, we should remove that objective. We could consider creating a back-to-work assignment as a follow-up. Really good objectives can help you determine the best blended learning element to use. Is it a single discrete task or skill? Multiple mastery-level objectives that require a mentor or expert guidance? As a very general rule, awareness training (lower on Bloom’s taxonomy) lends itself to self-paced learning. The higher we go on the hierarchy, the more sophisticated our supporting efforts likely need to be. Describe 4 key company-employment policies. At the remembering and understanding levels of learning, learners can refer to the policy handbook for a refresher whenever needed, so this might be a simple infographic or self-paced online learning piece. Explain our 3 levels of disciplinary action including verbal warning, written warning, and termination of employment. If our objective really is for the learner to explain these concepts, that implies interaction (online, over the phone, or in person), so we need to consider that. If we decide that it is sufficient to simply identify the 3 levels, that objective might be achieved with a survey, online multiple-choice quiz, or a matching exercise. Given an example of problematic employee behavior, select the correct level of disciplinary action. Again, easily achieved in an online course. Could be a microlearning refresher or even an HR WBT. Demonstrate documenting a verbal warning, a written warning, and a termination using the correct forms. This requires feedback and evaluation so is, therefore, higher on the taxonomy. The objective would need to be met with a more sophisticated WBT containing elements of simulation, an instructor-led experience, or perhaps a mentor/coaching session through an online learning community or on the job. Should you always list your learning objectives in your courses? The jury is out on this one. Some professionals say that measurable objectives help the learner know what to expect. On the other hand, often people know in advance (from the LMS, the email invitation, or the directive from their boss) why they are taking a certain course. If that’s the case, lists of objectives may be repetitive and can be annoying to learners. And for very brief microlearning, a list of objectives might be overkill. Use your judgment based on the circumstances. Tip: If you do decide to provide objectives, consider a creative way of presenting them. Maybe tell a story of a recent case where these skills saved the day or show the link between these skills and a probable personal goal, as in, "The next 30 minutes are going to make your work life so much easier by showing you some neat tricks in Excel that you can use right away". They help your stakeholders define and endorse the goals of the program. They provide the basis for assessment of the learners and evaluation of the program. They help you design a blended learning program that will best achieve these objectives. And, of course, they help your learners know what they can expect to get out of the different elements of the blended learning program. Writing strong learning objectives are key to the success of your blended learning program. As we mentioned above, they can be the basis upon which you evaluate the success of your learning offering. Too often, learning programs are designed without thought for what success looks like. Keep an eye out for our next blog article on evaluating blended learning.